This announcements serves as the official release date for our new Skyblock (Forest Awakening) reset. Note: If you are a Lazle player, your rank has been converted already based on the closest priced match. For example, Overlord ($100) credits you Legend on DatPixel ($100 value), etc. We've put a lot of work into this reset to ensure the most awesome experience possible. Can't wait to see you all there! Over the past month, 32 servers including DatPixel have been contacted by Mojang requesting them to comply with the EULA. The EULA is essentially a document created by Mojang that sets out rules and guidelines for what servers can and cannot sell in their store. Specifically, Mojang only allows the selling of cosmetics, and non game-changing donor perks. What steps is DatPixel doing? This week, we will be releasing three new global ranks. These ranks are King, Royal, and Hero. You are able to use these ranks across all servers, and are fully EULA compliant. Players who have donor ranks already (such as Legend, VIP, or Myth) will keep their current ranks as is. However, future donors will be unable to purchase these "Legacy" ranks in our store once we make the switch. Will I lose my rank? Will things reset? Let's begin this massive update off with a basic as to who I am. Some of you may know there was a server named Lazle, a Skyblock server run under DatPixel, which was owned by me and redfrosting since late 2015. This server is the reason me and redfrosting had met each other, and well, upon that we worked out a deal to do a partnership on it. Prior to that, we became really good friends and we both came to the conclusion I'll be joining DatPixel. This position will include management among the network, new advertising, and as an overall right-hand-man to redfrosting. This means massive updates and merging between the two networks (Lazle). 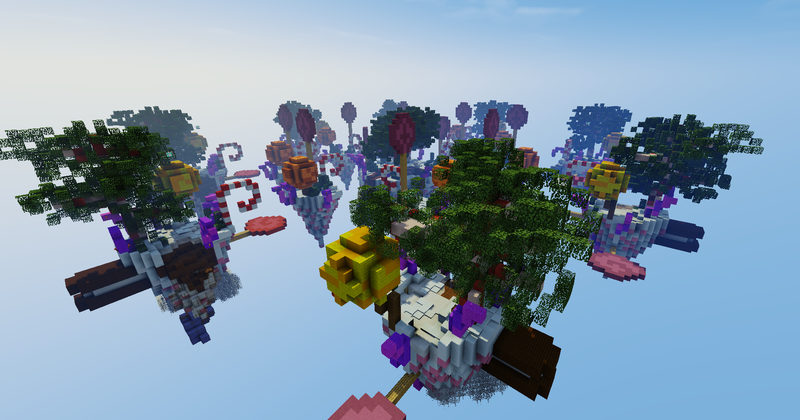 We have released 4 new Skywars maps, here are some screenshots of them below! Thanks to all who participated, we will be running more giveaways in the future! We've seen some very positive feedback from our new Myth rank, which includes special /emotes that are exclusive to Myths. You guys seem to be having a ton of fun with these, and I am as well! For those wishing to get their hands on the limited edition MYTH rank, this could be your chance! Simply comment your Minecraft username below to be entered into the giveaway! The winner will be drawn and announced at Sunday 2:00pm EST, best of luck to those who enter! ANYONE, including donators, found hacking for the second time, will be banned. Forever. "But.. what if I've never been banned?" For all of you first-time wanting-try-it-out hackers, there's still hope for you. You will be instantly banned for seven days, unless proven otherwise. Words of advice: don't hack. Welp, until next time guys! You may have noticed we got a new forums now. We are now running on a brand new Forums software which is speedy, quick, and easy to use. Simply click sign-up to get started and you'll be in the community in no time! We have a very beautiful forum design unlike our previous one which was quite basic. I personally love the new design, hope you guys do as well!